As our residential MF occupancies get bigger and denser we are being required to design systems which extend the time in which a safe environment exists for evacuation and for the staging of fire ground operations. These systems are lumped into one big category named Smoke Control. Smoke control systems are integrated into the building fire alarm and consist of several parts often designed by multiple engineering disciplines. Mechanical expertise is required to size the HVAC portions of the system while Electrical expertise is required to power the systems in a manner that guarantees operation during a fire emergency. The fire alarm designer is responsible for the Fire-fighter Smoke Control Panel (FFSCP) design and integration. These experts all have to provide a coordinated package that will be approved by the AHJ’s and presented to the construction trades for installation. The Smoke Control Systems are usually inspected by a third party prior to AHJ final inspection adding yet another step to the process. These systems consist of large fans injecting fresh air into our egress stairwells thus over-pressurizing the shaft and preventing harmful smoke from impeding the residents exit. Several NFPA codes give the designers methods and standards in which to effectively design these systems. These systems much like the stairwell pressurization are used to prevent the smoke migration from a fire to extend from the fire floor to adjacent floors or into the shaft which may be an egress path for disabled building occupants that cannot use the stairwell. These systems can be as easy as providing elevator lobby doors or curtains coupled with an elevator shaft relief damper or as complicated as shaft pressurization and relief for buildings without elevator lobbies or doors. Many large open areas such as atria require a form of venting or exhaust which moves the smoke up and out of the building to protect the occupants as they move to the egress pathways and out of the building during a fire emergency. Tall buildings require longer evacuation times and usually deploy all of the above methods for mitigating the transmission of smoke from the fire compartment to the adjacent floors and vertical egress pathways. It is common to exhaust the fire floor, pressurize the floor above and below and all of the vertical shafts. While the Fire Alarm System postures the Smoke Control System immediately upon activation of a fire emergency the FFSCP gives the responding fire-fighters the ability to manually over-ride any automatic operation and adjust the areas being pressurized or exhausted. The FFSCP in large buildings is located in the Fire Command Center which is a protected room generally with a door exiting directly to the outside facing the fire lane but in smaller buildings that don’t require an FCC it may be in the building lobby. The seamless design and operation of these systems is critical to life and property safety and thus heavily scrutinized by the AHJ’s. The other element that developers will note is the budgetary impact of the new and not so new smoke control requirements. The code is increasingly complex while our buildings are larger and larger requiring additional smoke mitigation for more occupants for a longer period of exiting. 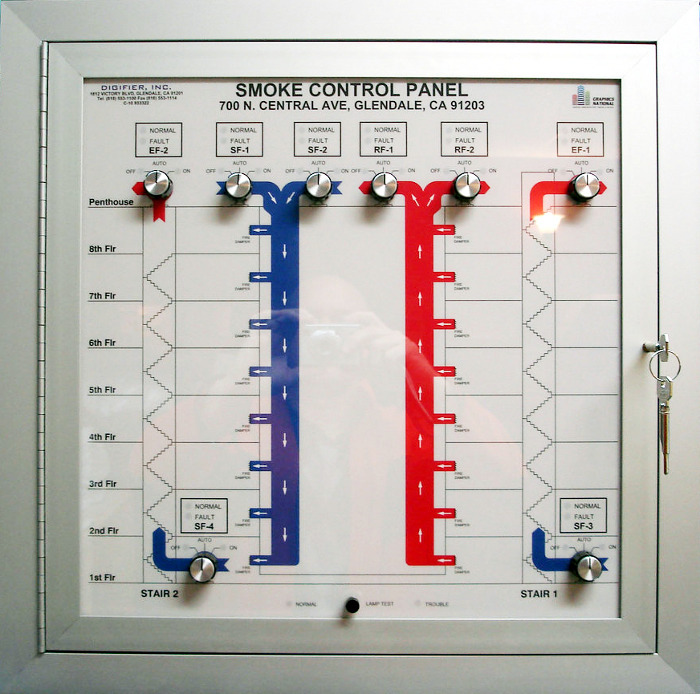 At SAFE consulting services we have been designing Smoke Control Systems since 2006 and have a workforce that is efficient and knowledgeable in the area. Our Licensed Engineers and Designers specialize in Smoke Control systems and partner with our developers and customers from the inset of design until final inspection.